Heat oil in deep-fryer to 350°F. Separate dough into 8 biscuits; split each into 2 rounds. Gently stretch out each biscuit half just a bit; add small scoop of cream cheese in center. Wrap dough around cream cheese; seal edges. Wrap each stuffed biscuit with half slice of bacon; secure with toothpick. 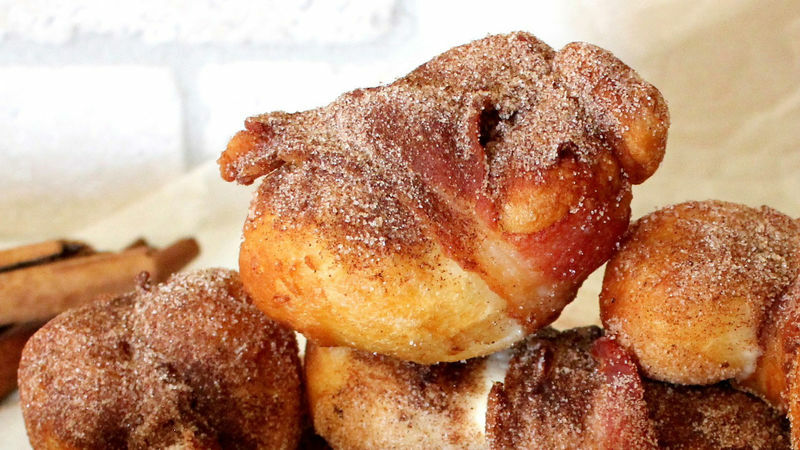 Fry bacon-wrapped stuffed biscuits in oil until puffed and golden brown on all sides. While warm, toss evenly in cinnamon-sugar. If desired, serve with maple syrup. You can flavor the cream cheese with some cinnamon or even chocolate chips for a fun twist! To reduce calories, try using turkey bacon and reduced-fat cream cheese (Neufchâtel).